A collection of seasonal anthems from Lil Boat. Available now only on Apple Music! Go listen! #SS2 Thank You For Your Patience I love all of you. Enjoy Your Summer. 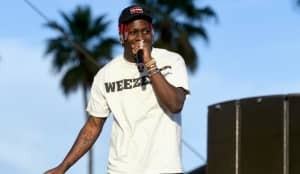 Lil Yachty's Summer Songs EP was the project that launched his stardom. Released in the middle of winter, it featured the Atlanta rapper's calling card hit "1 Night," which is now a ubiquitous moment on the timelines of rap internet 2016. Tonight, Lil Yachty has shared the seasonally appropriate Summer Songs 2. On the new project, he mostly keeps it in the family, recruiting Sailing Team mainstays like Burberry Perry for multiple features. Listen to Lil Yachty's Summer Songs 2, now available to stream on Apple Music. Watch The FADER's Lil Yachty film, Keep Sailing, featuring new tracks from Summer Songs 2.